The full name is the AZ Patio Heaters HLDS032-B but for some reason it is know under the name HL2. The measurements says 20.8 x 20.8 x 37.8 inches. here are some questions people asked online before purchasing this pyramid patio heater. We have included the ones we thought were most relevant for you. I read that someone thought it did not give enough heat on a winter-night. People still think they can heat their whole patio with a patio heater in the winter. A patio heater is for cooler nights in the summer and maybe fall. Specially a tabletop heater will not provide as much heat as a 40.000 BTU standup patio heater. 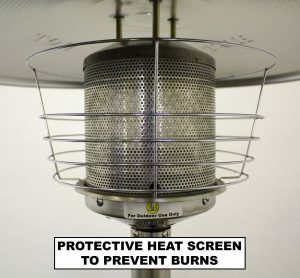 Look at our Pyramid patio heater reviews if you need more heat output. Back to the customer reviews. The opinions are a little mixed and like always I look at the lower ratings first. Most of them complained about not enough heat output and a few about the assembling not being to clear in the description. 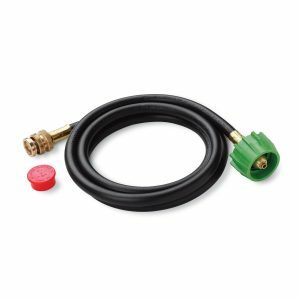 There are a lot of users that hook it up to a larger propane gas tank with a hose. Look at the bottom to see the hose we recommend for this purpose and use our-self on our grill. Reason is that the small canisters only last about an hour and a halve. Most people call this AZ table top patio heater okay for the money they paid for it. After reading a ton of reviews and opinions from people who bought and used this table top patio heater from the AZ company there are a few things we have to mention that are not related to the product quality, but to the expectations some buyer have. This type of heater is not to keep you warm on a winter day or night. It is for a cooler summer evening. Maybe in the south where the nights are not as cold it will work more months than in the north. 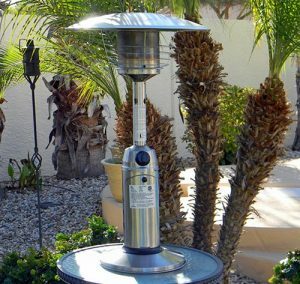 Our opinion about this AZ heater is that is a pretty decent table top patio heater and will give you some warmth while sitting on your patio around the table or placed on a smaller side table. Do not expect more than that. If you need more you have to invest in a larger patio heater. In a screened in porch however it is hard to use a large patio heater and than this one might be a better option. Overall we have not read a lot of complaints about the quality and durability of the heater. The stability is also good and no one mentioned any problem with that. There were a few that mentioned that they think that if it was a little lower the heat could be felt better maybe. Reason to keep it this height is that you can see under it and your view is not blocked by the heater on the table. No major complaints about the stainless steel and discoloring.